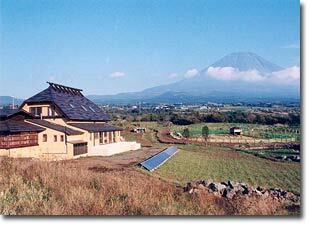 Fuji Eco-park is an eco-tourism attraction near Mt. Fuji. Masa Imai, a businessman/engineer started the park in 2000 to promote sustainable living as a way life and in the future. The park’s main aim is to spread permaculture awareness through educational tours featuring eco-friendly models and activities. A three hour drive from Tokyo, the park is located at the foot of the famous Mt. Fuji. It is surrounded by a magnetic forest and a succession of intricate caves. People come to the park for its many exciting programs, workshops and attractions. The most popular is a car conversion workshop, where around 100 have already been successfully converted. The park offers renewable energy models like a wood-fired oven and bath, electric powered motorbikes, along with sustainable planting activities that guests can enjoy. Fuji eco-park also provides accommodation for staff and guests in small buildings built with recycled century old Japanese farmhouse materials. The park regularly features green designs to educate the public about organic and sustainable farming. They have models for urban gardens, herb planting, garden layouts, a Biotope designed pond, livestock and beekeeping that use permaculture designs. These projects use natural, renewable and alternative materials for energy self-reliance and water conservation. Fuji Eco-park is also well known for demonstrating the power of renewable energy through biomass, solar, wind and electric energy models. The eco-park even has its own water purifying and harvesting system. Everything on the park is designed to conserve natural resources. The park is looking to build a Permaculture School (English language-based) to conduct lessons on green urban living in addition to fun English conversation tutorials. Management is also expecting further improvement on currently featured sustainable design models. The park is planning to add more station and balcony gardens as well. They are currently looking for designers below 30 years old to help improve park features. More Permaculture/English instructors as well as WWOOFers (Willing Workers on Organic Farms) are needed to make tours more engaging and fun for guests.